As part of my on-going experiments into alternative Lego train chassis and drive-train arrangements, I totally stripped down and rebuilt my GO Transit F59PH locomotive as a "technology testbed". The body was completely redesigned to be separate from the chassis and to mount to its chassis "clam-shell" style like scale model trains. This allows me to develop and iterate the chassis design independent of the locomotive. I intend to use this configuration for all my locomotives in future because I like the idea of being able to perform maintenance and tuning without a traumatic disassembly and rebuild of the entire locomotive. In fact, I hope to be able to interchange chassis among some locomotives with similar wheelbase for flexibility. I hope to be able to keep all of the mechanical and electrical infrastructure (controller, battery, motor, lights, etc.) mounted to the chassis with minimal connection to the body shell. Illustrated above is some of the progress made to date. I have rebuilt the F59PH body shell--its still not finished, but very close. The chassis is my 3rd version built to date. It is powered from a centrally under-mounted PF L-motor. This keeps the centre of gravity lower and allows for more room inside the body shell. The motor drives a central drive shaft connected to gear driven 2-axle bogies. The tractive effort of this arrangement is impressive, especially with the L-motor vs. the M-motor. 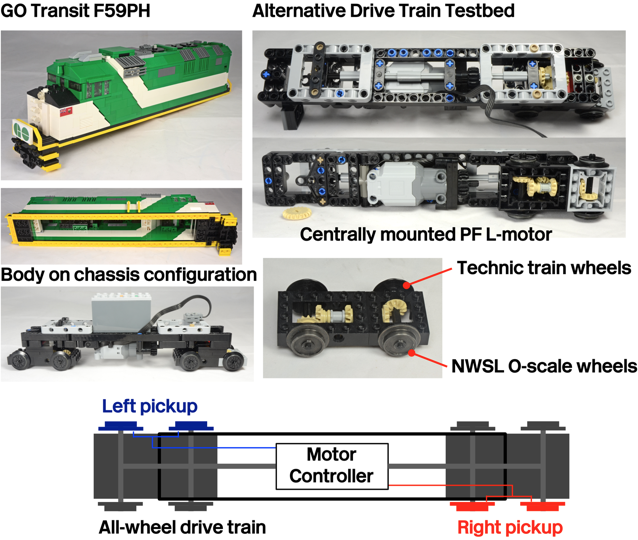 The next steps will be to develop a power pickup from the metal wheels and to fabricate and develop my hybrid DCC + PF electronic control module. Lots to do, but its great fun! I have been struggling with the issue of controlling Lego trains for quite some time. My layout has been built for operation with metal track and NMRA DCC control and my locomotives have been converted to run with DCC decoders attached to 9V motor bogies. However, I am worried about the future of 9V track/motors and have been bothered with the lack of performance of the 9V motor bogie. 2) HYBRID DRIVE - I love not having to worry about batteries when operating my layout at a show. However, I like the flexibility of battery operation and for running on plastic track. 3) TECHNIC/PF CHASSIS - I have developed a few prototype locomotives where the chassis and body are completely separate. The chassis is mostly built from technic elements with an all-wheel drive train powered from a centrally located PF motor. The chassis is nominally 5-studs wide to allow for a 7-stud wide body. The all-wheel drive chassis I have built have amazing tractive effort--easily better than any 9V powered locomotive. They do run a bit slower, but its a prototypical speed which I prefer. What you see illustrated above is a prototype electronic control module (which I have called LDCC+PF) which attempts to address some of the issues of train control. Effectively its a DCC decoder at its core. Unlike a DCC decoder it includes a battery/power management function and an IR receiver. Also, mechanically it is designed to fit with stud and/or technic pin attachments. 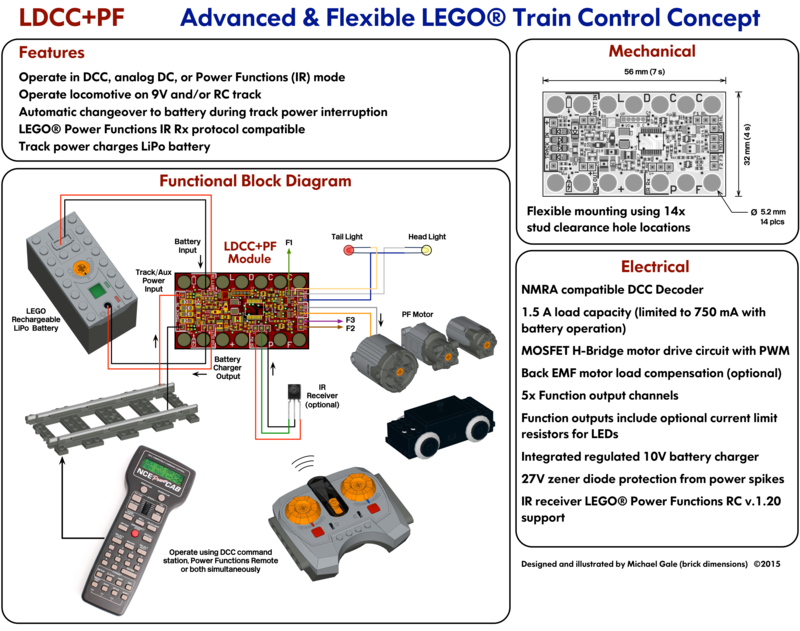 This module attempts to combine the best features of DCC and Lego Power Functions. The goal is to have reliable, powerful, and flexible locomotive operation. 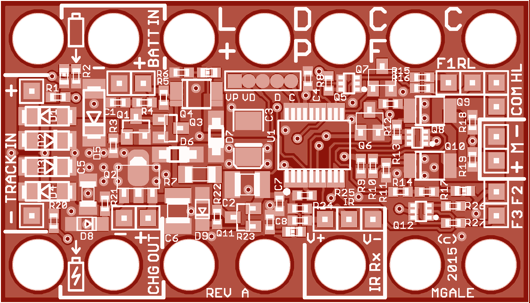 So far I have more-or-less completed the electrical design and printed circuit board (PCB) (shown below). I have fabricated the prototype PCBs and they are currently being tested. I have made a preliminary start on the firmware for the module's micro controller--but this will take a great deal of time. I do have a bit of a head start since I have based the DCC decoder design on MERG's DEC12 decoder. I am implementing totally new firmware on a different micro controller than the MERG design written in C rather than assembler. I also have to implement all of the Lego PF IR protocol in addition to the DCC. I hope this experiment turns out--I do look forward to my ambition of a hybrid-drive train chassis!